...the aim of the game is simple. All you have to do is look at our showcases and determine the amount of profit one would get for (hyperthetically, naturally) liberating them from the residence of a dead ex-employer. First tonight we have the Klondike dress, worn by Princess Diana during a tour of Canada in 1997 and by me (allegedly, naturally) at various times in private afterwards. It is made from finest silk collected and fashioned by child slaves in Burma. Without Diana's marvellous efforts against landmines, far fewer child slaves would have the amount of upper limbs required to produce such fine fabric. I have to say that it does rather pinch around the groin area although I suspect it was not designed for burly gentlemen with 15 years worth of private letters secreted down their boxers in order to remove them from the premises. The second showcase tonight is Princess Diana's collection of furry slippers. You too could own this piece of history - high quality artifacts made from genuine English wildlife tortured and captured by her ex-husband and sons. No royal worshipper's collection of morbid memorabilia is complete without slightly soiled and tasteless items of a personal nature. Finally tonight we have autographed Chris De Burgh Y-Fronts. 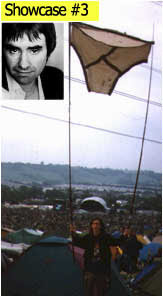 Diana's favourite crooning one-hit wonder's underpants shown here getting an airing at Knebworth. A quality weave and attractive triple-stitched 'Y' make this a Gentleman's pant, now of historical interest to collectors from around the world. To own these pieces of history, all you need to do is spoon-feed an egotistical, self-obsessed, paranoid parasite with smarmy obsequiousness until you get a chance to half-inch them.